Participation levels low days after prices rocketed from $20. If by any chance Kroger accepts Litecoin after banning credit card fees due to high fees, Litecoin (LTC) will surge. The coin is up to fifth and 4.6 percent from last week’s close as bulls cement their position shaking off sellers. From inception, Litecoin founders were very specific. With all the pomp of a censorship resistance and global money that will eventually be a medium of exchange as well as a store of value, Litecoin wanted to be silver to this digital Gold. To some extent, they have been successful. Thanks to their low fees—expected to decrease to a tenth of current transaction rates and fast block generation, merchants are slowly gravitating and trusting this new form of digital money. If anything, they are actively contributing to the burgeoning blockchain ecosystem where everyone has control of their assets. With low-fee architecture, we also expect more to use Litecoin, and if we add to Mimble Wimble and the possibility of private transactions, it’s an all go for Litecoin. They may also capitalize and even convince Kroger, which recently banned Visa cards citing high fees, in their Smith’s Food & Drug Stores. If they do, LTC prices will undoubtedly surge from spot rates. 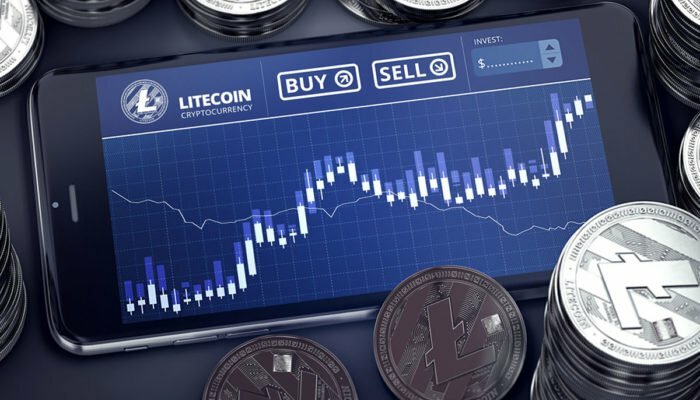 At spot rates, Litecoin (LTC) is up 4.6 percent in the last week but down 4.4 percent in the previous 24 hours. It is understandable because this draw-down has been across the board. Even so, it is clear that the trajectory, the path of least resistance is upwards as our trend line shows. Since bulls are in control trading within a breakout pattern with supports at $35 and $40, every low should technically be a buying opportunity. That applies for risk-off, aggressive traders. Like in all previous LTC/USD trade plan, bulls have a chance from an effort versus result point of view. 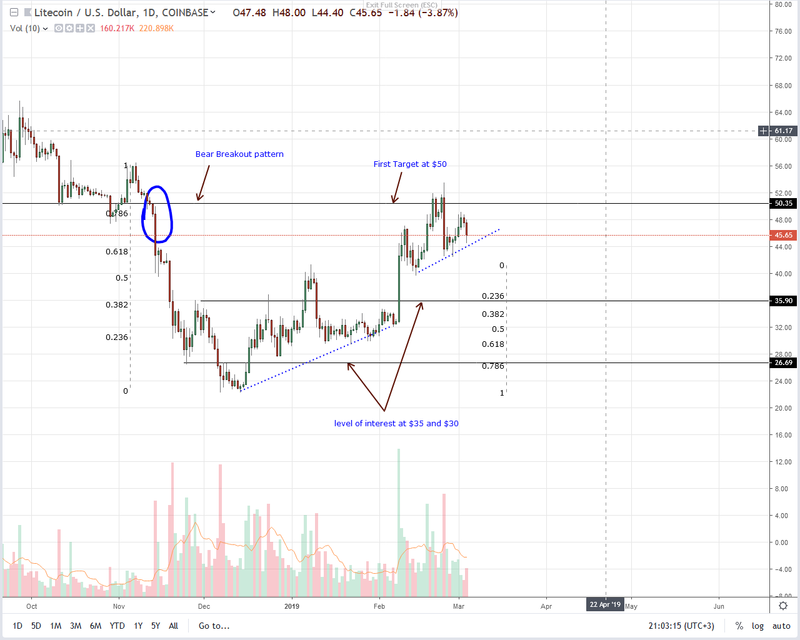 Once prices close above $50, odds are Litecoin will finally rally to $70, $90 and even $110 by mid-Q2 precisely what the market expects as prices bottom out from $20. Volumes are stable, and our reference bar is Feb 8, high volume bull bar—832k versus 202k. As volumes stabilize around 220k, we need to see an upsurge above $50 complete with high volume mirroring those of Feb 18—552k. Ideally, volumes should also exceed those of Feb 24—577k. Only then will we be confident of bulls.